Welcome to the Storm Center. 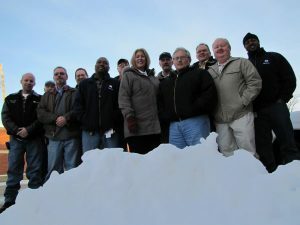 It is a dedicated conference room nestled in Metro’s Right of Way (ROW) Maintenance office, where teams of supervisors, managers, drivers and workers are getting ready for one of Metro’s biggest challenges in a snow or ice storm: clearing the walkways, parking lots, platforms and transfer centers. “We play weathermen,” said John Quinn, Supervisor of Bus ROW Maintenance. Preparation doesn’t start at the same time you are thinking to yourself, “Should I wear my boots to work today?” Starting in July or September, ROW starts testing equipment they will need during the winter months. Trucks are sent to the shop. Bags of salt and sand are ordered. Drivers and managers are trained on the best way to maneuver around cars and stack snow on park-ride lots. Metro has 43 locations, like station platforms, that require hand work and shoveling. Thirty-three locations use plow trucks, and 11 use over-the-road salt. Before the first flake falls from the sky, dozens of people are set to work 12-hour rotating shifts, 24-hours a day to keep on top of the weather. The moment the forecast calls for wintry mix, a plan must be devised: how many people out there, which locations first, how much time do we have. Volunteers are organized, and extra help is brought in. The ROW storm teams know that while preparation and organization is crucial, no two storms are alike. 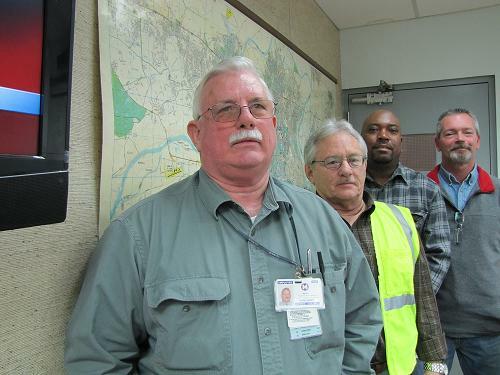 “They are all different animals,” says Mike Creamer, Supervisor of Rail Facility Maintenance. “Every storm is dynamic. You have to keep your eye on it all the time.” The Storm Center is equipped to handle a constant barrage of information from national, local and field reports. Snow can fall slowly for hours, then dump 6 inches in an hour. Or the wind can blow heavily, covering freshly shoveled walkways with the fine powder. Add in the complications of holidays and weekends (remember the Christmas Eve snowstorm?) and equipment breaking down after 24 hours in the cold, and you have a living, breathing operation. ROW supervisors spend a lot of time on team training, to make people very familiar with the locations so they can respond quickly to obstacles. Vehicle Maintenance provides support, staying open to do immediate and often on-site repairs during the brunt of the storm, and the Communications Control Center works and coordinates with the team’s progress. “We have a lot of good people working on it. It’s the people, they are the ones out there that get it done,” urges Director of Right-Of-Way Maintenance Chuck Clemins. When asked to talk about Metro’s storm response, he immediately wanted to highlight the work of the people that make up the Storm Center team. It is a hectic time, but the team members insist it is worthwhile work. “There is a great sense of gratitude when it’s over, when people can get to work,” Quinn explained. My final question to the ROW Storm Center team: so what’s the weather going to be like this weekend? They wouldn’t commit to any predictions. But I will tell you one thing: they aren’t hanging up their snow boots just yet. Yes, when winter weather comes, that means water main breaks. When there are some, why keep reroutes on watermain break secret? There were some on Kingshighway and once again, reroutes of a Metrobus was kept secret. I am always grateful to Metro for its continued service during winter storms. People take it for granted but there is so much that needs to fall in place for uninterrupted service. I don’t know, Patrick, but I see water main break reroute info all the time on my Metro Bus Rider Alerts. I’m not sure how they decide what goes into an alert and what doesn’t – Court would know, but she’s out today – but that might make for an interesting post in and of itself. I’ll check into it. Again, I am thankful to Metro! I was on time for work, had no delays! Special thank you to Northbound #10 bus that reaches CWE station at 8:15 for keeping us on time.